26th Jan was coming close, and this time it was on a Friday, making room for 3 days, perfectly suited for a trip. Just inorder to avoid the crowded places on this long weekend , me & my friends decided to explore something which isnt frequently visited by all. After searching for sometime, we finally fixed on Bandaje Arbi Falls, located near Ujire, Daksina Kannada. So the plan was all set. Me with my friend were to reach Ujire early morning on 26th from Mangaluru. Luckily, due to the Shiradi Ghat work going on, almost all the buses to Bangalore from Mangalore go via Ujire. We caught a bus from Mangaluru KSRTC bus stand by around 7, reaching Ujire by around 8:40 in the morning. After having some breakfast and packing food for the noon, we set out to the trek starting point. The trek starting point is the Gowdra Mane, which is around 10km from Ujire Bus stand. One can find a jeep from Ujire , and with a little bargaining, can make it affordable. 1. They dont let people to stay on top of the falls anymore. 2. The place was crowded like hell, since it was a long weekend. Left with no option, we decided to keep all our tents and sleeping bag, back in Gowdra mane, took permission from forest officer, who was already present there, We started the climb after completing the formalities of registering with the forest officer there. The trek to Bandaje Arbi falls is a moderate one, taking around 3 hours to reach top. Only the last half-or-one kilometer seemed to be more stressful as sun was on its peak and there were hardly any shade left due to recent forest fire. Once we reached the falls, it was time to relax. The water wasnt at its peak, but quite enough to sit around the stream and enjoy our lunch. Though our initial plan was to continue further to Ballarayanadurga fort, but due to not getting permission to stay atop, we had to head back to Gowdra mane. Post lunch we started to head back and managed to reach the base in around 2-3 hours. That night we had to stay at tent near Gowdra mane itself. Due to sudden change of plans, we requested them to provide us dinner as we were quite unprepared for this. Luckily enough , they were sweet enough to provide us with dinner. Along with us there were quite other people too who were staying at their place, some with tents , and few who were staying inside their house. The next day we woke up, wondering what to do today. Luckily enough there are other places to see here. From the base we headed to Didupe Water falls. The water fall is around 20-30 mins thru transport. Luckily there's a bus which runs in this route and we managed to board that bus. The bus drops near the Didupe School, which apparently is the last stop. From here one has to cross several fields and through many houses until finally come across the road to the falls. Apparently there is a motorable road which leads directly to falls but its quite lengthy to walk if one takes this road. Didupe water falls was however very blooming, We enjoyed quite sometime in the falls here. After the falls we were left with no other place to go. Thinking about what to do next, we decided to visit the other side of Charmadi Ghat, the Kudremukh side. We were left with 2 options, either to take public transport and reach to Samse through road or walk through the forest leading to Samse. We decided to take the road which was less taken. We planned to head to Samse from Didupe through the forest. We started to walk around 11 in morning. The path wasnt that quiet tough but the hot scorching sun along with the luggage we carried made it tough. Even though the path was tough it was good in its own way. Though we couldnt spot any wildlife in this forest area, but we came across many falls with countless streams. The journey was really fun and filled with numerous sight seeing spots. It was almost 5 and much to our dismay we were still walking. Even though we had started early in the morning, we managed to reach Samse only by 5:30. 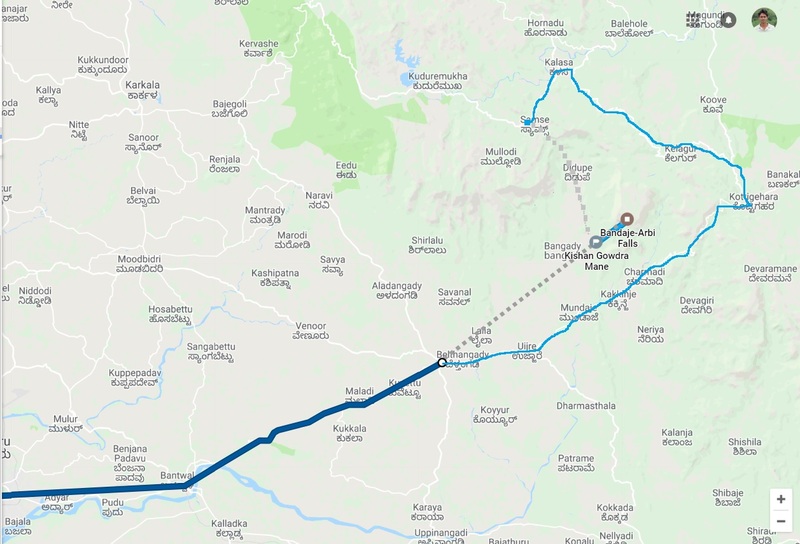 By the time we reached Samse, we got to know that the last bus to Karkala had left few minutes ago and there is no other mode to go to Karkala. We tried our luck by asking for lift, but it dint work out. Left with no other option we had to go to Kottigehara and catch bus to Mangaluru. Finally we managed to reach Mangaluru by 11 in night and from there i headed back to Udupi. Overall it was a worthy trek and quite tiresome (the second day) but was amazingly beautiful in its own way.